Since John Eckersley retired from teaching Geography nine years ago he has been able to devote much of his spare time writing walking books for Christian Aid. When his wife Nancy retired as Vicar of Heslington in York, they decided to do a major sponsored walk for Christian Aid. It was the the Land’s End to John o’Groats walk, or ‘LEJOG’, the ultimate challenge for long-distance walkers. For walkers, part of the excitement of LEJOG (or the ‘End to End’ walk) is deciding which particular route to choose because there is all manner of possible variations. 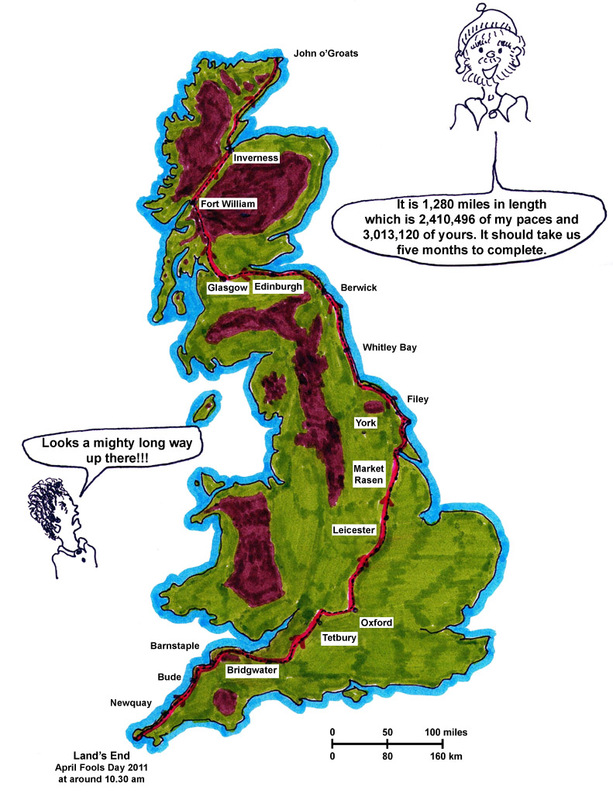 According to some experts the shortest possible LEJOG walking route, entirely on roads, is 868 miles. But John and Nancy opted to stay off-road whenever feasible. Devising your own route, of course, means that there is no official distance for LEJOG but John and Nancy’s walk measured 1,280 miles and took them through their new home of Flamborough which, by a strange coincidence, is exactly half-way between the two ends of the walk. The record time for walking LEJOG is reckoned to be held by a soldier of the Royal Artillery who in 1986 completed the End to End walk in just over 12 days. John and Nancy did it rather more leisurely; in fact, a lot more leisurely as they averaged just 10-12 miles a day and so allowed themselves time to investigate places of interest along the way. They took five months to complete the whole walk. Perhaps this explains why they chose 1st April as the starting day for the adventure. 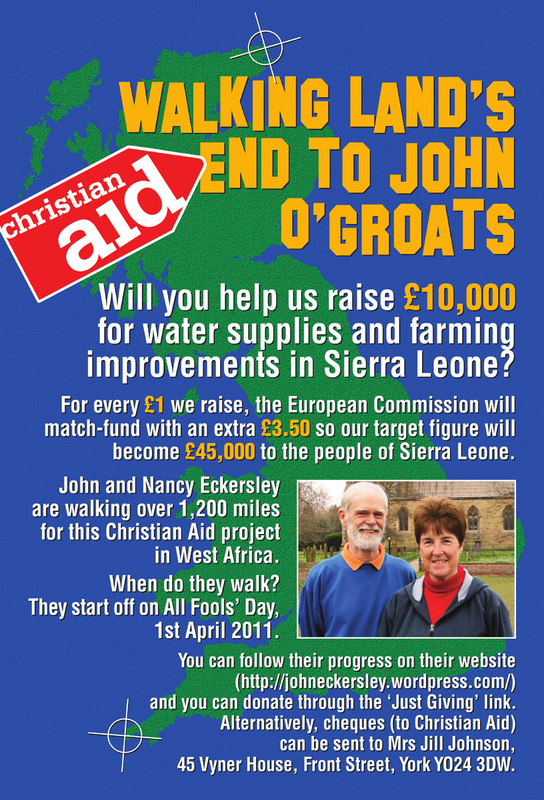 John and Nancy committed themselves to raising £10,000 for a Christian Aid Partnership project in Sierra Leone. This small West African state is about the same size and has about the same population as Scotland. The country suffered a brutal civil war in 2002 and is one of the poorest countries on earth – life expectancy is only 47 years and only 50% of the population have safe drinking water. Sierra Leone is ranked 180 out of 182 nations according to the UN Human Development Index. The Christian Aid Partnership project aims to improve farming and to provide clean water in two parts of the country. What makes this programme important is that every £1 raised by Christian Aid is match-funded by £3.50 from the European Union – this is certainly an attractive proposition to all donors! Update (August 2011): The appeal for the farming and clean water project in Sierra Leone has reached its £10,000 target. This is wonderful news and we thank very very much all those who have generously given donations so that this has been achieved. Donations are still coming in and that money will still go to Sierra Leone. We have chosen to support a maternal health project sponsored by Christian Aid and match funded by the EU (in this case, every £1 raised is match-funded by £3.00). For further information about this additional project follow the links below. Details of John and Nancy’s journey can be found on this website. Click on Blog to read about their venture. Update (January 2012): John and Nancy’s walk has now reached the final total of £15,000. With the match-funding that the European Union will add to their figure, an overall sum of £65,000 will be released for development work in Sierra Leone. They wish to thank everybody who contributed in any way at all to this extraordinary effort and to assure them that their support and generosity has been hugely appreciated. Starting from Land’s End, they followed the South-West Coastal Path to Minehead, went cross-country to Bath, picked up the Thames Path to Oxford and then went through the East Midlands to the Humber Bridge and Hull. From there they chose to follow the North Sea coastline all the way to Edinburgh, from where they crossed to Glasgow and took the West Highland Way to Fort William. After that, the Great Glen Way took them over to Inverness and then the final section followed the east Scottish coast to John o’Groats.